as·sure [? sh?r] (past and past participle as·sured, present participle as·sur·ing, 3rd person present singular as·sures) transitive verb 1. convince somebody: to convince somebody of something assured us of her sincerity 2. make somebody confident: to overcome somebody’s doubt or disbelief about something I can assure you that every word is true. 3. make something certain: to make something certain to happen Proper planning assures that the job will be done right. 4. U.K. insure against certainty: to insure somebody against something that is certain to happen, e.g. death, rather than something that might happen, e.g. loss of or damage to property [14th century. 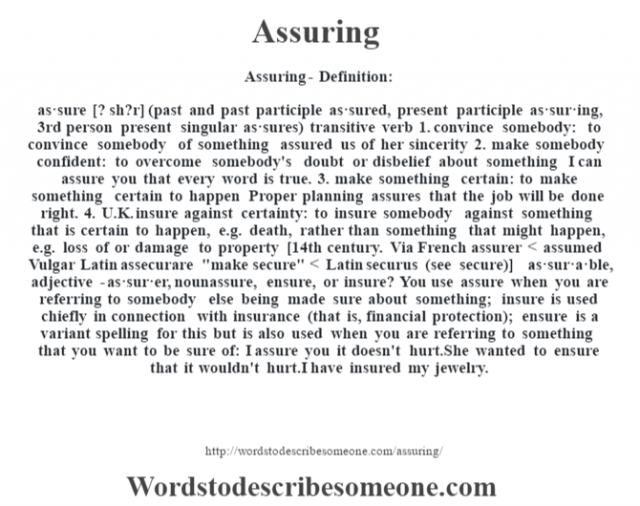 Via French assurer < assumed Vulgar Latin assecurare "make secure" < Latin securus (see secure)] -as·sur·a·ble, adjective -as·sur·er, nounassure, ensure, or insure? You use assure when you are referring to somebody else being made sure about something; insure is used chiefly in connection with insurance (that is, financial protection); ensure is a variant spelling for this but is also used when you are referring to something that you want to be sure of: I assure you it doesn't hurt.She wanted to ensure that it wouldn't hurt.I have insured my jewelry.